With 2017 drawing to a close I just wanted to say a BIG THANK YOU to all of our couples who had a Sticky Fingers Cake Co wedding cake this year. Thirty four wedding cakes with one more to go on 28th December making 2017 the busiest year at Sticky Fingers Cake Co HQ yet! Onto the gorgeous Houchins in Coggeshall in July for Laura and Jon’s beautiful summer wedding. 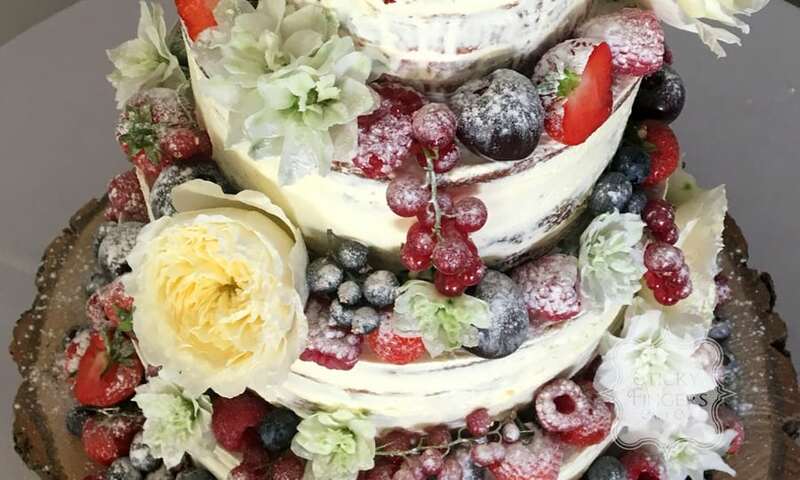 Nothing suits Houchins more than a semi-naked wedding cake which I decorated in summer berries and a few selected fresh flowers. Stunning! It was back into some Vintage creativity in July for Jay and Ian’s three tier cake, this really is me in a cake; lace, sugar pearls and open sugar roses – lovely! Delivered to the gorgeous Roslin Beach Hotel in Southend. Jennifer and Lee’s wedding cake in August was so cute! Just a simple two tier wedding cake finished off with cute bows and eight cupcakes topped with sugar sunflowers. So pretty. Thank you again to all of you. With twenty eight wedding cakes already booked for 2018 it looks as though I will be even busier next year! Merry Christmas and a very happy 2018 to everyone.